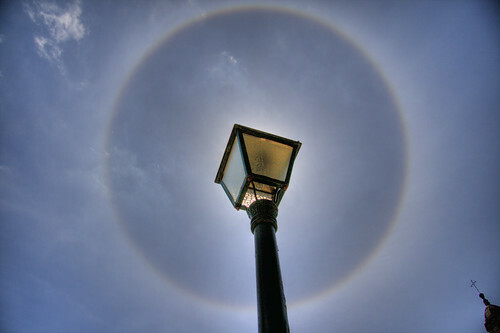 A phenomenal solar halo! I've been wanting to get a glimpse of one of these for as long as I can remember and have never seen one with this intensity. 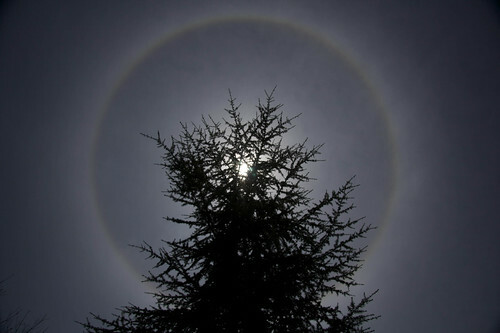 The sky is pretty clear but presumably the ice crystals in the atmosphere which cause the 22 degree halo are currently plentiful enough that we get this stunning solar performance. For lots more information about this and other effects I highly recommend going to the atmospheric optics website which has a wealth of pictures and discussion about this sort of amazing effect! Didn't get to see all the other effects in your photos, but still great to see this one. Will be keeping an eye out for more.